We are heading out on a nice vacation tomorrow. We're flying to the UK and taking an escorted highlights tour of Scotland and Ireland. This will be followed by a week in Glasgow, Scotland. While in Glasgow, we'll be attending the Ryder Cup Golf Match. There's lots of excitement around this match because it is only played every two years. It alternates between a USA city and a European City. As part of the event, we'll be attending a big Ryder Cup Opening Gala Concert where we will hear live bands like the Red Hot Chili Peppers and many local bands. We will also get to meet the celebrity golfers and just be part of the wind-up. My husband is a golf enthusiast so attending this golf match was kind of on his bucket list. He is routing for Europe. I'm excited to go too, but I'm joking with my friends... I tell them to watch for me on TV while the match is on (Sept. 26, 27, 28). I'll be the lady in a Canada Red shirt holding a sign that says "Eh, I should be home Quilting!". I may or may not post while I'm away. I'll be back on October 1. Can you Fly and Knit? Do you recognize frogged yarn? I've started this little scarf three times It's a knit along project on Ravelry. This yarn is very fine mohair but I'm using larger size 5.5 needles. I thought it would be a great project to do while watching TV and also to work on on our up coming trip to the UK. But I can't seem to get beyond the first dozen rows. It's a simple pattern but I keep ending up with extra stitches and I can tell the lace pattern is not developing the way it should. 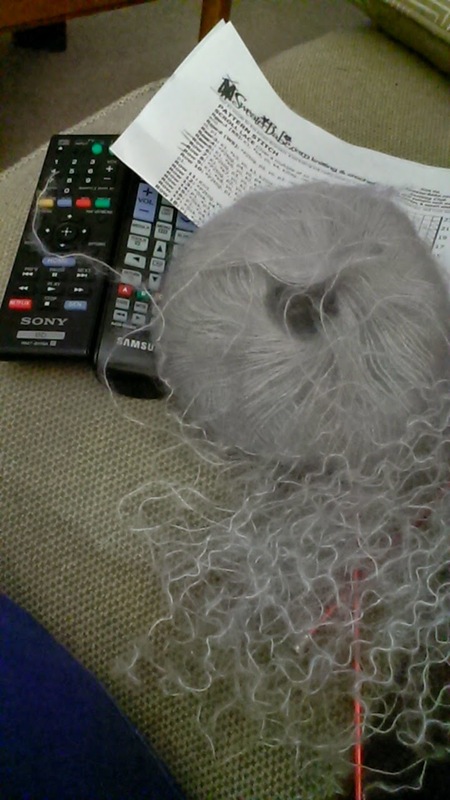 I could be rusty.. Hmm... Or Maybe I need to concentrate and not watch TV until I have the pattern down. Does anyone know if you can take knitting on an airplane? Do you do this? Use your presser feet for another use than the one it was intended. 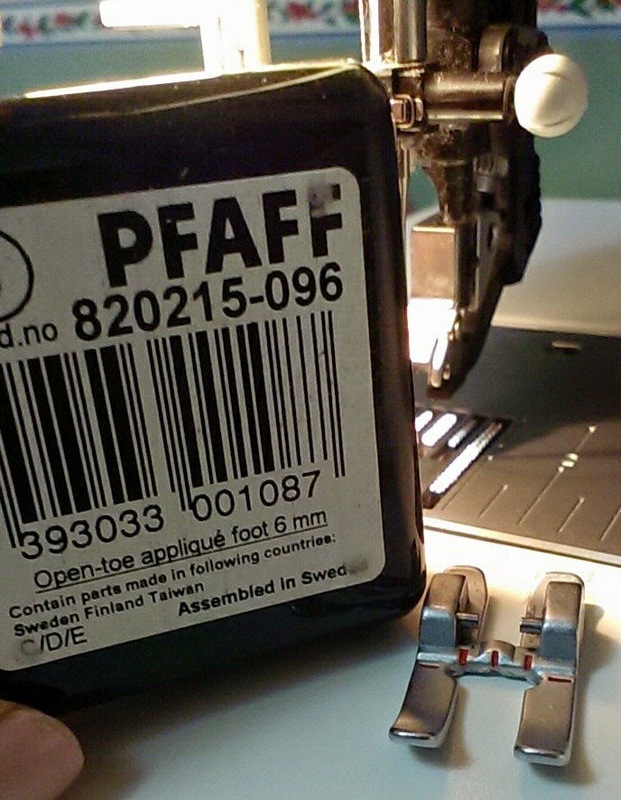 I have many feet that I use on my several Pfaff machines. In particular, I have used this 6 mm open toe applique foot for everything over the years. Lots of zig-zaggy things such as satin stitch etc. But lately, I love it for top stitching. Most, if not all of my small projects have some sort of top stitching on it. This foot has red markings which I use for eye-balling where I want my stitching to be. And the center opening is exactly a quarter of an inch. That means that if I use the edge of the inside of the foot as a guide, and leave the needle in the center position, I will get a nice one eighth inch top-stitching detail. 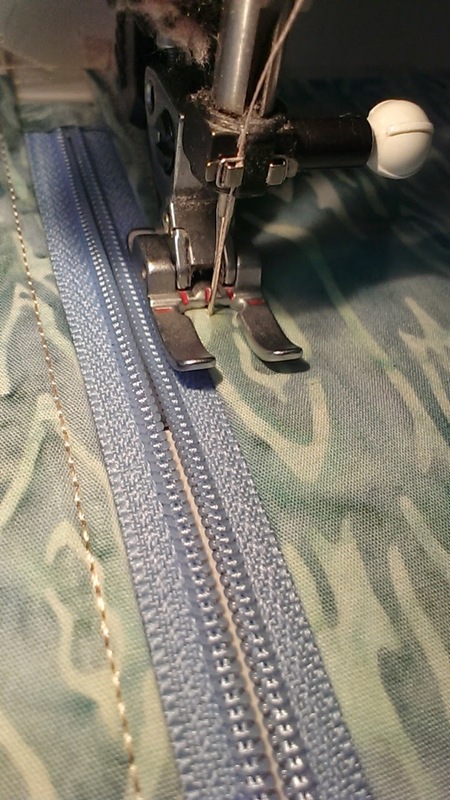 When I do zippers, I find that one side of this applique foot rides nicely on the zipper tape when doing the stitching. Even as can be. Judy S. was in my test class in early August. If you recall, I was working out the kinks in this new wallet class that I'm teaching. Because of a family appointment, she couldn't stay for the last bit of the class. She was so close to being done and I knew it would not take her long to finish. Well, she came over today for some light guidance and she completed the wallet in no time flat. Isn't it beautiful! 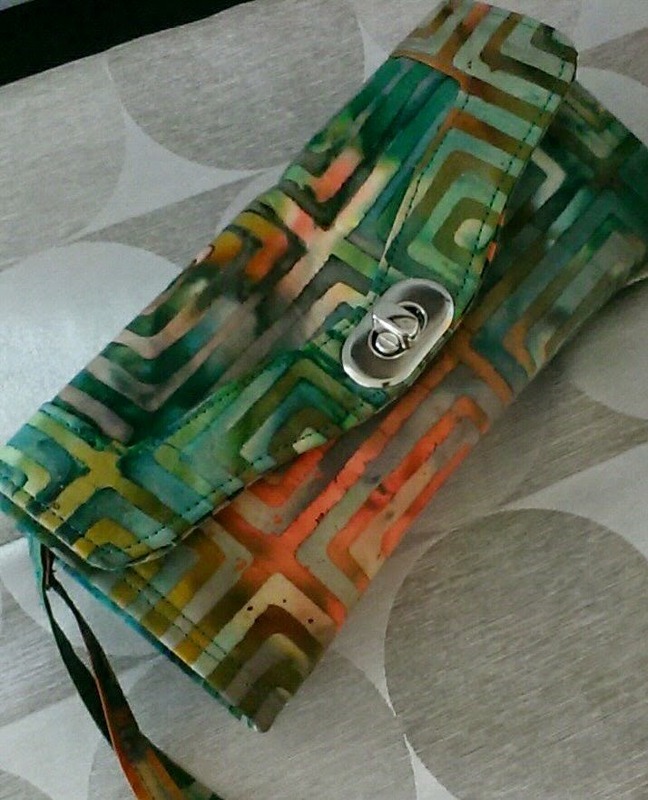 It looks like a "Maritimer's Fall" wallet as the greens transition to other colors. I've added this photo to the rest of the class photos that I posted here. And I'm pleased to say that 100% of the students have completed their wallets. I'm hoping the to keep the 100% going when I teach this class in November too. With such a busy month of August, I just got around to making pickles this week. Earlier in the week, Linda H. gave me some giant cukes from her garden. I made her Lady Ashburnham pickles, which are now not only a "Fredericton Favorite", but also favorite in this house. Less sweet, few ingredients. Easy Peasy. Also, over the weekend, I picked up some small cukes, peppers and onions at the farm vegetable stand and made my sister's bread and butter pickles. We run out of those every year. It's a simple one day recipe. No need to soak overnight. Just three hours. So we chop in the afternoon, and bottle in the evening. 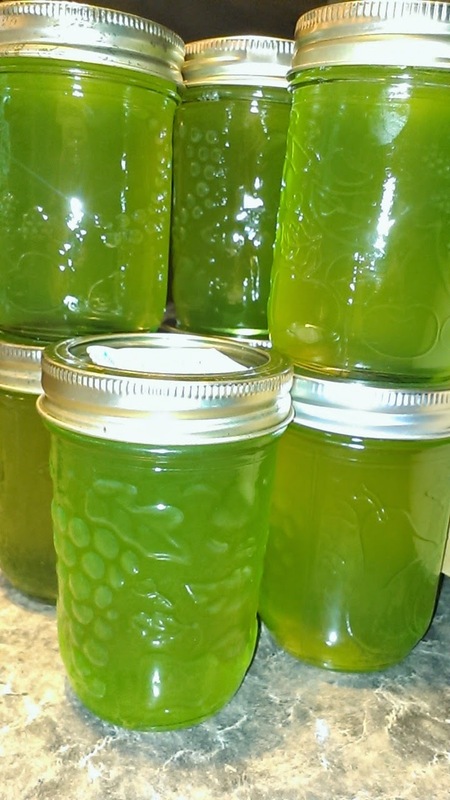 Today, with 3 leftover giant cukes from Linda H. I made this fabulous fresh Cucumber Jelly. It's eaten with cream cheese on a cracker. It's so fresh!! When I look at my blog hits, I seem to be getting tons of hits from Pinterest. My daughter used to buy cucumber jelly from a vendor at the craft markets. Then the vendor stopped coming to the market. After a bit of research and asking around, this recipe came from one of our senior quilt guild members who wrote the details from memory on a scrap of paper. It's delicious. Linda H. I have a bottle for you. Thanks for all the cukes his week. Remember I showed you the completed wallets from my test class earlier this summer. 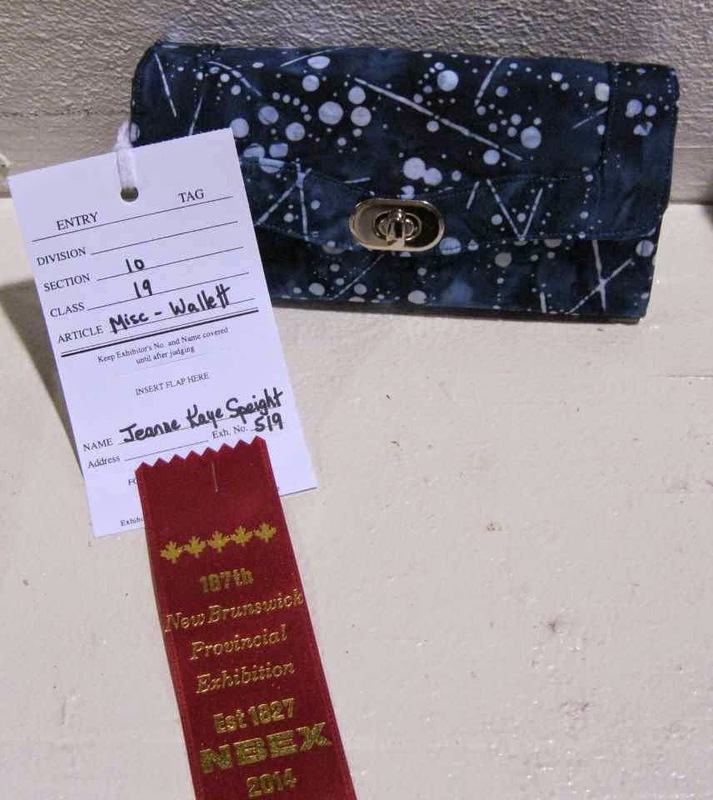 Well Jeannie Kaye entered her wallet into the Fredericton Exhibition. It won a ribbon. I'm not surprised. It was made with beautiful blue batiks and it was an elegant eye catcher. I'm so pleased for her. Who doesn't like to win a ribbon at the NBEX!! Congratulations JK! I'll be teaching this class at the Fredericton Quilters' Guild in November. 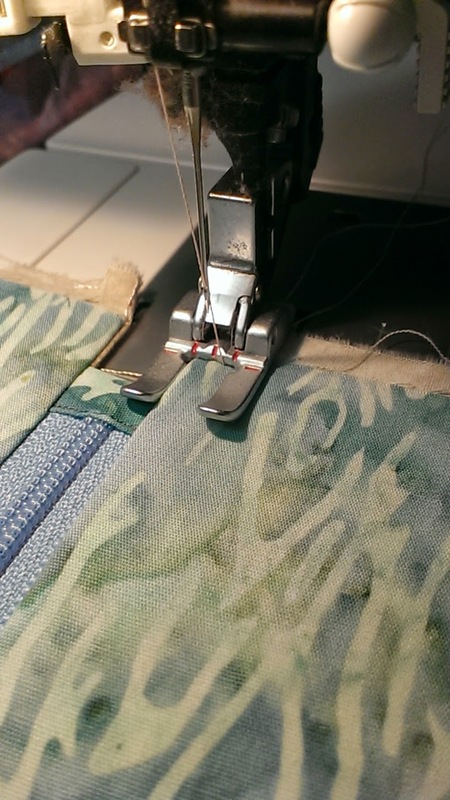 If you are local quilter and want to take this class, let me know. If there are extra seats in the class, I'll put you in touch with the workshop coordinator.